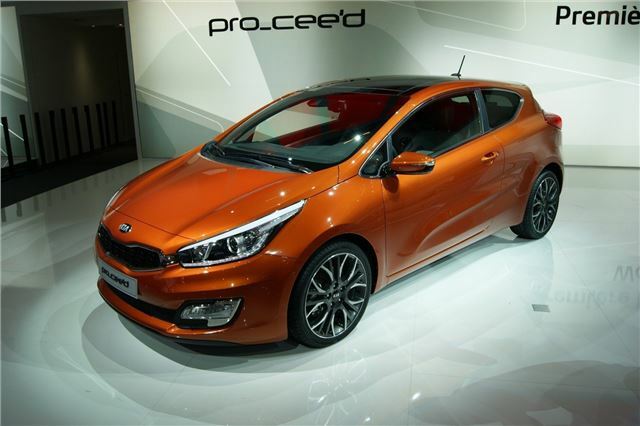 Kia has unveiled the new Pro_Cee'd at the Paris Motor Show, the third and final model in the Cee'd range alongside the hatch and the Sportswagon estate. It will go on sale in the UK in Spring 2013. The Pro_Cee'd has the same family face as the standard Cee'd, albeit with a lower bonnet, but it's very different further back with a rising rear window line, thick rear pillars plus smaller a 40mm lower roofline and more angular rear lights. With more of a coupe appearance than the last Pro_Cee'd, this version should be a strong alternative to the likes of the Vauxhall Astra GTC. It will come with the same 1.4-litre and 1.6-litre petrol and diesel engines as the standard Cee'd model plus a performance version is in the pipeline, rumoured to be powered by a turbocharged 1.6-litre engine developing more than 200PS.